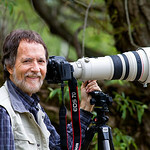 Richard Tetrault is a wildlife enthusiast and photographer located in Ottawa. He has been taking photographs most of his life and concentrating his skills in the last decade following the strong passion he has for wildlife and nature. Richard studied at School of Photographic Arts (SPAO), an independent photographic visual arts school in Ottawa. He specializes in landscape and bird photography, as well as macro photography. He has covered live music and special events including the United Nations Fundraising division. Richard's photographs have appeared in Canadian Geographic, and local newspapers. The Ottawa Citizen featured his story on the large Snow Geese migration, with a photograph of the event on the front page. His travels have taken him to the interior of Vancouver island, the Bugaboos in British Columbia, the Tonquin Valley near Jasper Alberta, Arizona, Cuba and many places in between. He travels to Cape Hatteras every year documenting the extensive bird activity, especially the egret and heron rookeries, and local bird sanctuaries. He frequents nature preserves, swamps, forests and other areas in his travels to find that perfect image of natural beauty. His his other big interest is in night photography, and his favourite time is during the rise and setting of the full moon. He offers custom frames and over-size prints. He has produced custom design calendars featuring his photographs. His images have appeared in billboard sized nature backdrops used in architectural and commercial projects. Visit Richard's blog to read about his travels!